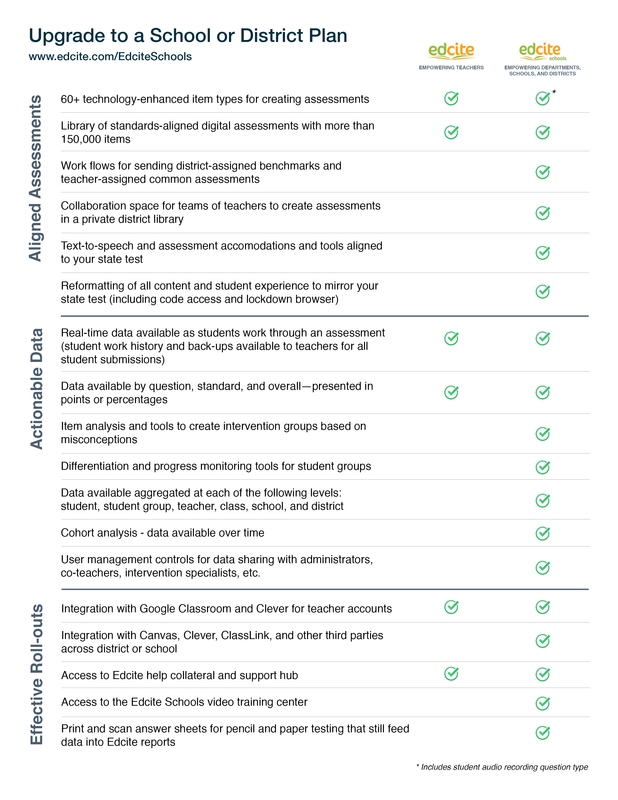 Why is Edcite Schools the common assessments platform for your school or district? Find or build content aligned to your state standards. Mirrors your state's assessment viewer. Instant feedback for students, teachers and administrators. Respond to data with intervention groups. Advanced Reporting: Item Analysis, Growth Reports, Student Standards Mastery and more! Our Edcite Schools premium reports allow administrators and teachers to analyze assessment data at the district, school, classroom, teacher, intervention group, and student level. Request a demo to learn more! Create a private library wherein your school or district teams can build and share common assessments. Use versatile distribution settings to customize delivery of assessments to multiple classes across schools. Explore data at all levels: by District, School, Teacher, Classroom, or Student. Deep dive or analyze aggregate data. Gather meaningful data about student performance by standards that are state specific. Create role-based accounts for coaches, team leaders or admins. Upload class rosters & group students easily. Provide students an aligned testing experience with state-aligned assessment format, tools, and accomodations. Ready-To-Use Item Bank with 150,000+ Questions! Edcite Schools has made giving Common Formative Assessments and collecting the data from them so much easier and quicker! The continuous updates and improvements in the reports give teachers timely access to the data they need to make decisions about instruction for different groups. Shelby City Schools is using Edcite Schools as our "go-to" assessment platform for students in grades 3-10 so that they are prepared to take the Ohio state online assessments. Edcite Schools has opened the doors for our teacher-based teams (TBTs) to have data readily available to make instructional changes and monitor all students. As an instructional technology specialist, I use Edcite to build assignments and send these to multiple schools and teachers in my district. Edcite's question types have prepared our students for what they will see on the PARCC assessments. Request information about our premium platform and learn how to use our digital common assessments to improve learning in your school or district.